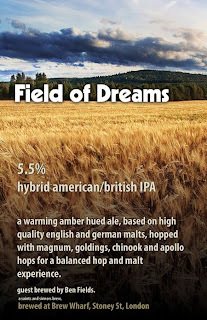 I'm pretty sure I just missed the special dry-hopped version of Field of Dreams by a single pint! The guy in front of me bought two and then the barman turned the pump clip around. Traumatic. Anyway, ten minutes later and we're ready to rock with a brand new cask. This is the third beer that Saints and Sinners have produced at the Brew Wharf in London Bridge. First up was Hoptimum; followed by Gold Fish Bowl. (You can read about them here and here). 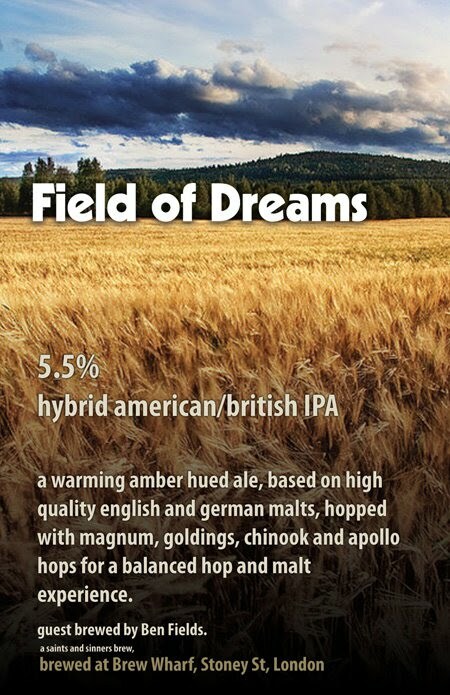 Field of Dreams was brewed in collaboration with Ben Fields - home brewer and all round nice guy - when Saints and Sinners (S&S) threw the brewery doors open and invited him to brew. From a home brewing background themselves, S&S are becoming incredibly pro-active in narrowing the gap between amateur and professional brewers. Something that's commendable, exciting, valuable and worthy of its own blog all at once. (More of that another time). The beer. Straight off the bat you can tell this pint is in excellent condition; a creamy white head sits atop a gorgeous copper coloured beer. For me, the aroma was a little subdued. 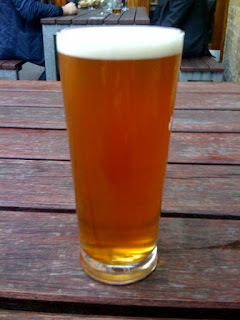 It is worth noting that I was drinking outside though, so it might be slightly unfair to criticise. On drinking, all is forgiven. It starts with a subtle sweetness, then you get wonderful pithy orange citrus and then a really pronounced cereal-biscuity malt character. The finish is bitter but not massively so, it starts small and then grows on you. In the mouth its smooth, really smooth, it's crisp in the finish and refreshing. This is a fantastic beer, easily my favourite of the three. I think it's being served too cold though. It was noticeably cold in my hand and it was by no means a warm evening outside. There's a slight haze to it and, as I've said, the aroma does feel a little subdued. Both these things could be down to serving temperature. As it warmed I noticed the citrus get bigger and the bitterness become more pronounced. A grapefruit-bite came through in the finish and a slight resinous, oily quality was detectable in the mouth. All things that made the overall beer even better. These trips to Brew Wharf are almost becoming a regular thing now; and long may it continue. I would pick, drink and enjoy this beer every day of the week. Hats off to S&S for sharing the brewery and to Ben for making a great beer. Man that sounds good!! I envy you being close enough to drop in and try all the new brews. As for the temperature... I'm ok with it being quite cold, the pale and hoppy beers suit a colder temperature. A stout would be too cold though. Agree that very hoppy, pale beers are nice when chilled. If the hoppyness isn't massive though, I personally think it can suffer from being served to cold. With this one it just came through better when warmer. I'm in the area on Friday (before doing The Bull IPA fest :-o). Do you think there will be any S+S stuff left? Should have yeah ... both Hoptimum and Goldfish Bowl lasted longer than that, so you should be ok.